eBay copper jug offer - eBay has copper jug from Indian Art Villa brand in 37% discount price. Actual price was Rs.795. Sale price is Rs.497. Total discount is Rs.298. I have bought one for me in this offer price. Copper has a lot of health benefits. How to avail this eBay copper jug offer? 1. Visit eBay copper jug offer page here. 2. 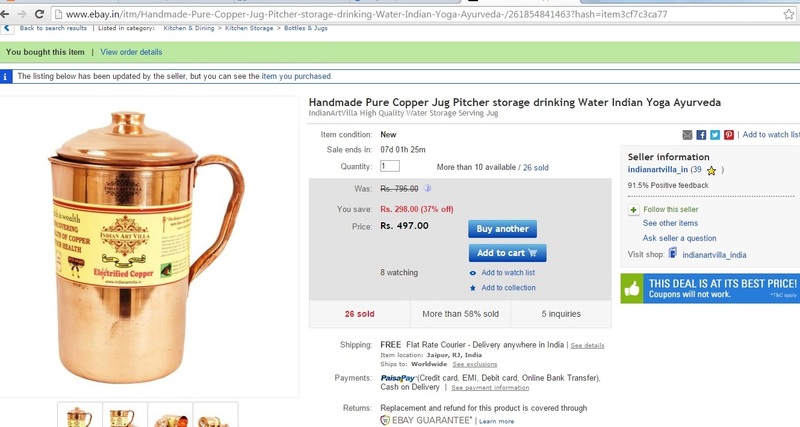 Add to cart and buy the copper jug in offer price of Rs.497 with free shipping. Note: This is a limited period offer. Might be valid only till stock lasts. So hurry up. 1. Handmade pure copper jug. 2. Can be stored to drink water. 3. Covered under eBay gurantee. 4. Can be paid via PaisaPay. 7. Copper jug has a lot of health benefits and recommended in Ayurveda. 9. Brand - Indian Art Villa.